This is a handwritten one and a half page letter written by Roy Thomson to Daniel Mascioli, son of Leopoldo (Leo) Mascioli. It was written with blue ink on a Prince Arthur Hotel stationary. 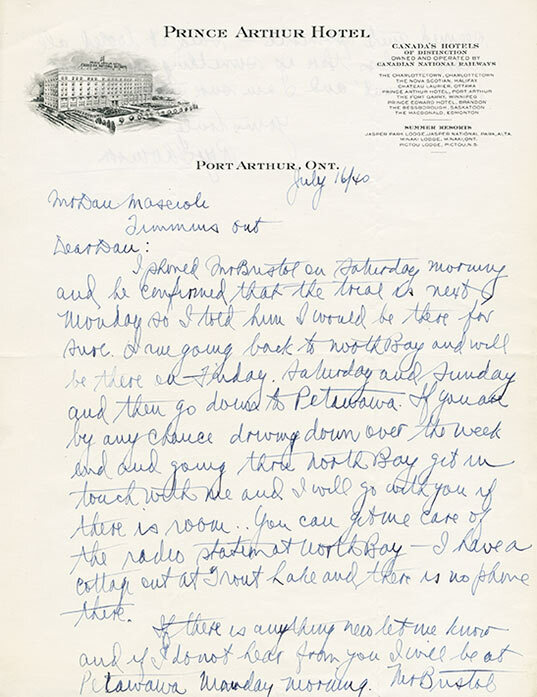 The letter is dated as July 16, 1940. Roy Thomson was a successful Canadian media mogul and businessman. He owned many radio stations and newspapers in Ontario, as well as other businesses. In 1931, he acquired a radio station, CFCH, which aired out of North Bay, ON. In 1934, he acquired his first newspaper, Timmins Daily Press. It was likely during this time that he met construction magnate, Leopoldo Mascioli. According to Leo's granddaughter, Joan McKinnon, Roy was one of the few who remained friends with Leo during and after the internment period. In this letter, Roy informs Daniel that he will be in North Bay in the coming weekend and then heading out to Petawawa on Monday morning. He invites Daniel to come with him to Petawawa to attend the trial - presumably Leo's trial.